If you are using Basecamp 3 you can connect your Basecamp account with Workstack. However, before you do it's important to review the following checklist. This integration only works with Basecamp 3 accounts. You must be the Owner or an Admin of the Workstack account you want to connect. 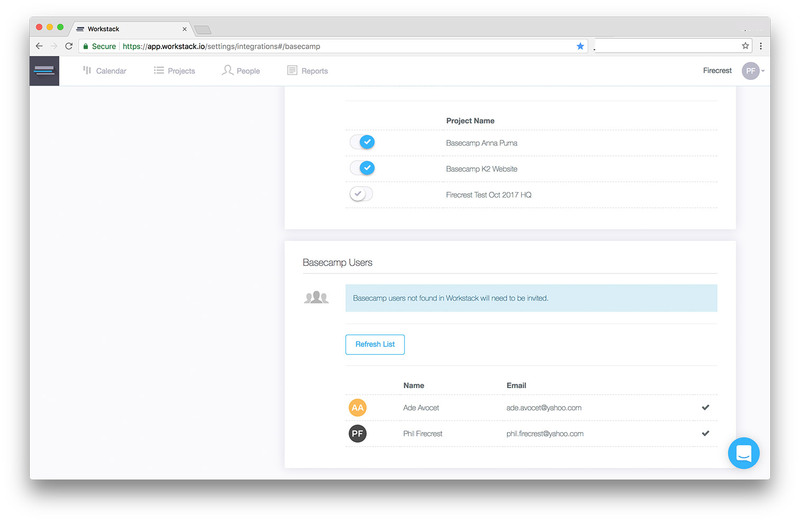 Once connected you will only see in Workstack those projects you have access to in Basecamp, so make sure the login details you use have access to all your Basecamp projects. The Basecamp account you use to connect will be the one that shows up as having made all the actions. e.g. if you connect using the Basecamp account of John Doe then whenever anyone does anything in Workstack it will be John Doe that shows in Basecamp as having made the action. Therefore it's a good idea to use a generic Basecamp account when making the connection. Make sure you are logged out of Basecamp. Open the Basecamp 3 settings by clicking Link to other apps from the admin menu at the top-right. Enter the login details of the Basecamp 3 account you want to connect to. 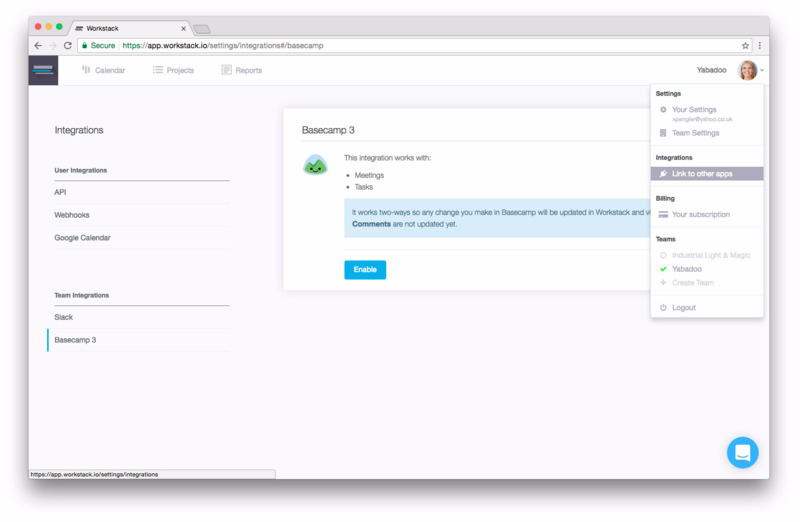 When the connection is made all your Basecamp projects will be imported automatically into Workstack. From the Basecamp Users list invite those people who will also be using Workstack. Note: If Workstack finds a match with an existing Workstack user then they will automatically be connected. Most updates between the two apps shouldn't take longer than 10 seconds, however when you add a new project or user to Basecamp it could take up to 10 minutes before it shows in Workstack. Remember this is a two-way connection so updates you make in one system will update the other, and this includes creating and deleting projects. 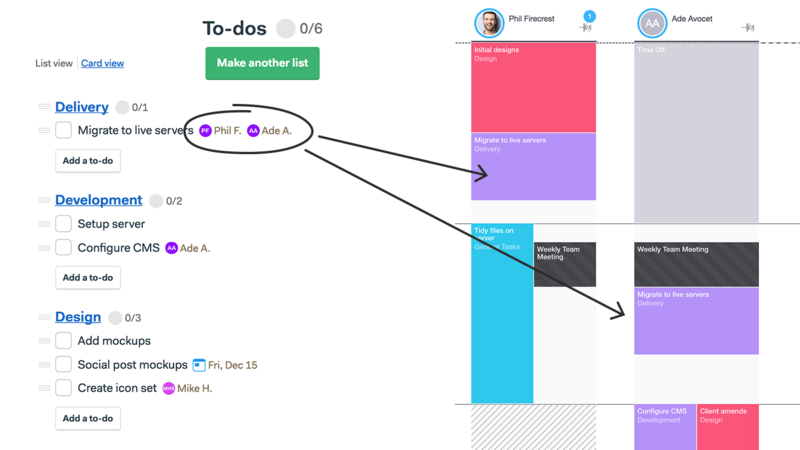 Tasks on the Workstack calendar are linked to the Assignee in Basecamp not the Todo so if you change the Due Date on the task it won't update your Basecamp Todo you'll need to update the Todo not the Task. Comments do not currently update between the two systems. Notes only update one way from Basecamp to Workstack. Note: Workstack only stores notes as plain text so any attachments or links will not be included. Only the Owner or an Admin of the Workstack account can see this link. For new projects that are created in Basecamp you'll need to click Refresh List then Sync Projects before you'll see them appear in Workstack. Only where the email is matched between a Basecamp and Workstack user will they be automatically imported into Workstack. Otherwise they will need to be invited, to do so just click the Invite button that appears next to their name in the Basecamp User list. Note: If you can't see the user you might need to click the Refresh List button first. If a user is assigned a Todo in Basecamp but you can't see it in Workstack it might be in their hidden column, just click the pin icon at the top of the user's column to take a look in there. If changes are not updating there might be an known issue with our service or Basecamp themselves maybe experiencing problems. In such a case get in touch via the chat tool and we'll look into it. 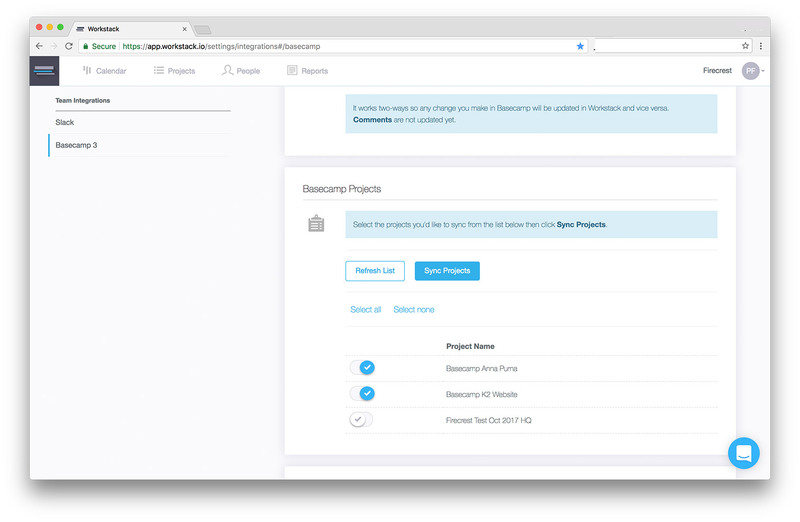 Make sure that the checkbox next to those Basecamp projects you want to import are marked blue before clicking Sync Projects. Just contact us either using the in app chat tool at the bottom right or send us an email and we'll disconnect the account for you.